My first overnight bus journey to Belo Horizonte was uneventful due to the execution of my plan to get sufficiently intoxicated beforehand! With reclining seats and my iPod fully charged I fell asleep as soon as my head hit the pillow. I had left a little earlier than I originally intended so I arrived early on Monday morning. After checking the internet for a map, I ventured in one direction from the bus station to get my bearings and soon found myself asking for directions, namely back the opposite way! I admitted defeat and sought tourist information for a local map and advice. I opted for a short walk alone in this new city, and managed to follow the inked line to my destination. Checking into the Dayrell Hotel was even less successful. The rest of the group weren’t arriving until that evening, but the staff were unable to identify our booking. Luckily one of the porters was helpful enough and allowed me to leave my backpack and suggested I attempt to check-in later. That gave me the opportunity to explore B.H., with a few errands to attend to as well. I decided to start by checking out the Municipal Park – it was not yet open! So instead I made my way to Praça da Liberdade, the city’s main square. 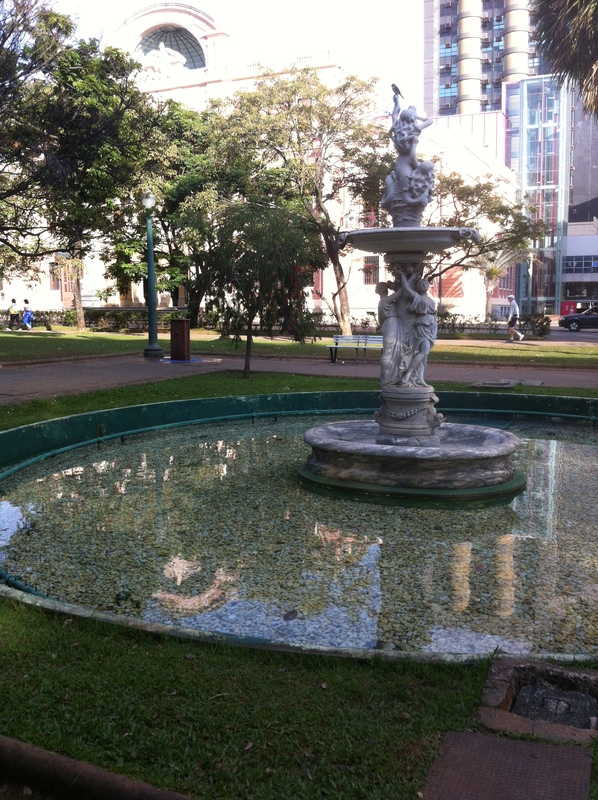 Headed by the Palácio da Liberdade, formerly the office of the government of Minas Gerais state, and flanked by historical buildings transformed into museums, the centre has a pretty park with fountains and statues. I spent some time taking in my surroundings and re-orienting before heading to the Savassi neighbourhood in search of internet, food and phone accessories. I managed to tick these off, eventually managing to get a Brazilian SIM card and Brazil-friendly charger, plus getting online to resolve my hotel problems. The area seemed to have a building atmosphere even at this early hour so I vowed to return later, spotting pedestrian streets with big screens and stages, as well as market stalls. Back at the hotel, the staff still couldn’t identify my booking so I had to charge my phone to email my friends as I glimpsed the final games of group B kicking off. Obtaining the booking confirmation didn’t speed things up significantly as staff members poured over their screens, but the booking was eventually identified when I wrote a list of all 6 of our full names. It seems that the influx of World Cup visitors was taking its toll, as I had noticed that 3 separate guest parties were having problems with booking errors. In our case, they had registered the 3 rooms under 2 names, none of which were the person who had made the booking! Leaving behind the drama of the glamorous hotel lobby, I gratefully moved into my hotel room to watch the conclusion of Holland’s win over Chile before enjoying a much needed shower and snooze. 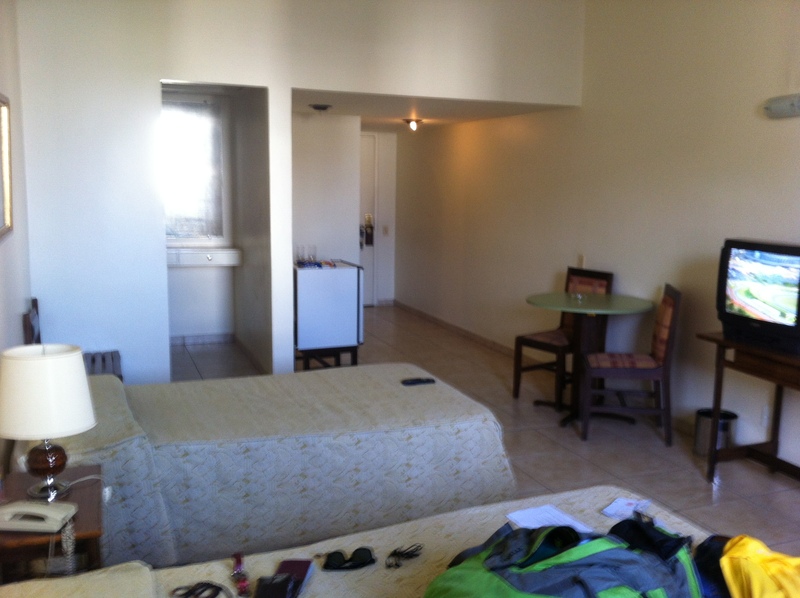 The timing of our stay amid a mass of England (and some Costa Rica) fans meant that accommodation options were limited at the time of booking so we had to pay for an expensive hotel (I’ve never stayed somewhere with so many porters)! Facilities were pretty good, though our schedule didn’t allow for much time in the gym, sauna or spa! Being able to call each other’s rooms proved useful and amusing, but sharing 1 working lift between 15 floors of people meant we sometimes stretched our legs and spiralled our way downstairs. Breakfasts were pretty good though, so it was a good stay overall sharing my room with Alex. Forcing myself out of bed from my nap, I trusted my orientation and research to check out Belo Horizonte’s fan-fest. Full marks on orientation, no marks for research – I can only assume that the original fan-fest location was changed to a bigger venue. Minding my budget, I crossed the city on foot to Savassi and arrived only a little late for Brazil’s last group match. The bars seemed to all be pretty full and I settled for joining the mass of people crowding around the screen of one bar/off-license. The crowd enjoyed a 4-1 thrashing of Cameroon, with whistles and horns on top of cheers and chanting to create a great atmosphere with building hope for Brazil’s World Cup prospects. I met a group of Soloman Islanders at half-time but proglonged conversation during the 2nd half and ensuing celebrations proved near impossible, particularly down to one Brazilian lady relentlessly showcasing her vast array of horns and whistles! We unsuccessfully searched for a bar then stumbled across another street full of revellers, which seemed to be the centre of the party. We climbed onto a bench to hear a mass of Brazilians cheering, chanting and clapping to the beat of the drum. Having earlier seen the Official England Fan’s Club swamping one street with noise, the Costa Rican fan’s joined in on this South American party. After enjoying some Brazilian dancers on stage, the Soloman Islanders retired for the night and I shortly followed suit with the arrival of my 5 companions drawing closer. I had warned Alex I would probably be napping, but I was up and raring to continue the night when they eventually arrived. The decision was made to head out in our England attire, and sure enough we were ridiculed by Brazilians as soon as we emerged from our taxi, back on Savassi’s streets. “Eliminado” was the typical chant, which we tried to humbly endure and occasionally join in with. The party seemed to have tapered off by this stage, so we called it a night after just a few beers. On the morning of England’s last match, circumstances had conspired to render the game meaningless. And sure enough, with Costa Rica only needing a draw to secure 1st place, my fear of “as long as it’s not a bore draw” came true. 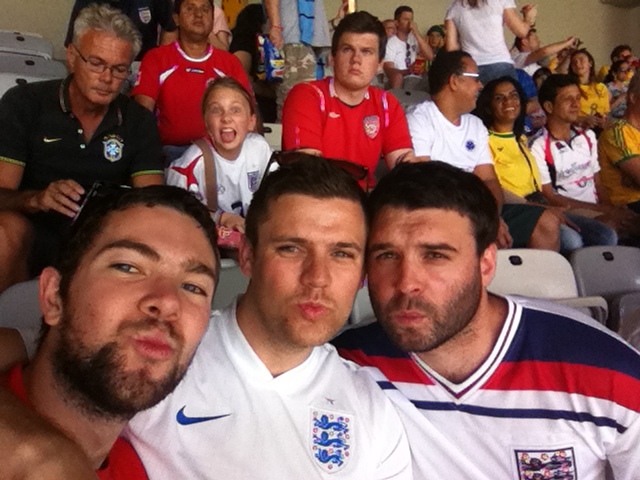 But since this was the only ticket I had secured for the entire World Cup I tried to soak up every detail to share. There was a slight buzz over breakfast, but nothing compared with the hope and excitement I experienced for the previous two games. It was nice to finally hold a World Cup ticket as we boarded the bus bound for the ‘Estadio Mineirão’ and our ironic chants of “We’re on our way” began to create a little atmosphere. And despite an excessively long bus journey we made our way round the lake in beautiful sunshine and up towards the stadium. Passing through numerous security checkpoints, I noticed that no locals around the arena seemed to be selling the usual shirts, scarves, hats, bracelets and memorabilia that fans would be only too happy to part cash for. We deduced that this must be due to the security restrictions and FIFA’s monopoly of official merchandise. Inside the arena, FIFA seemed to have missed a trick too: failing to produce matchday programmes and restricting merchandise sales to isolated shops. Pouting in our seats before the game! In terms of purchasing beer, they offered Brazilian Brahma or Budweiser and provided unique matchday cups, which fans obssessively collected. But with 15 minutes to kick-off and no upper tier concourse, I retreated downstairs to queue at one of the drinks carts. These queues moved pathetically slow and I only just made it back upstairs to hear the end of England’s national anthem, belting it out with some fellow English latecomers! The game itself had potential to be exciting, with Hodgson putting out a young side but the game failed to spark alive. Wilshere showed flashes of brilliance (and yes I acknowledge I am biased), while Barkley got the crowd excited at times, but England showed few signs of creativity or urgency. Costa Rica largely spoiled the game looking content to play out a 0-0 draw. When Hodgson resorted to the tried and tested (and historically unsuccessful) Gerrard, Lampard and Rooney combination we dismally failed to retain possession, with the game fizzling out to cap off England’s dismal World Cup. The Brazilians in the crowd expressed their disapporval, with the loudest chants of the game devoted to Neymar or declaring Pele’s superiority over Maradona. We got a few rounds of Mexican wave too. But for me, the mix of English, Costa Rican and Brazilian (amongst other neutral nationalities) in the crowd prevented a good atmosphere developing. No doubt the patch of England fans in the opposite end of the ground would disagree, but overall I left after the final whistle lacking a true World Cup experience. I vowed to find another opportunity! The after party (England’s farewell) started with some typically useless service at a restaurant in Savassi (we joked that they must be busy adding more ice to the men’s urinals) and then we steered away from the pedestrian streets flooded with young Mineiros (people from BH’s state, Minas Gerais). So the 6 of us found seats outside one bar, playing ‘taps’ for amusement, a fast-paced drinking game they mastered during their years playing football together. Amid our banter, we heard our English compatriots singing typically moronic anti-German songs (as we have little else to celebrate for our national pride) and guessed the ages of one underage group with their guardian encouraging huge gulps from bottles of spirits. They even allowed a young Brazilian girl (our guess was 16 or 17 at most) drink impressive gulps on several occasions, who later was left slumped on a table – luckily her friends were there to take care of her. We left in search of some sort of club, passing and giving up on our guidebook’s suggestions and followed a local’s advice to a Brazilian country music (Forró) club. It was an interesting mix of live country music and more mainstream pop, with locals and gringos having a good night. Culture Alert: Like in Buenos Aires, Brazilian restaurants, bars and clubs tend to separate payments from serving you food and drinks. Table service is most commonplace, but for late-night venues they either mark your card with drinks ordered and calculate the total payment later, or require you to order and pay first, before presenting the receipt at the bar for service. Either way involves queuing twice, while grabbing a quick drink at a bar does not exist! And so I find myself hideously off point, grossly over-worded, and try to drag my writing back to the argument I was initially considering: Was it worth the trip? And would I recommend a trip to Belo Horizonte outside of the World Cup festivities? Well, I certainly don’t regret my time in BH. I flew 14 hours to experience Brazil’s World Cup and watching my nation play was a must (no matter how poorly or pointlessly)! 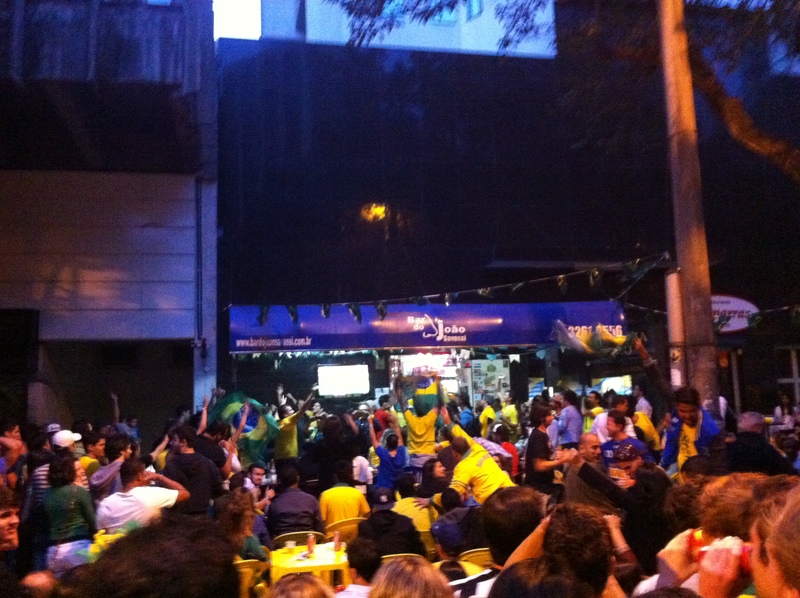 I was also fortunate enough to experience a Brazil match on it’s streets and the celebrations afterwards. Although I again failed to sample the city’s fan-fest (which two English fans later praised highly for their experience as gringos everyone wanted to meet), I must give a big thumbs-up to the Savassi neighbourhood for hosting a great atmosphere. 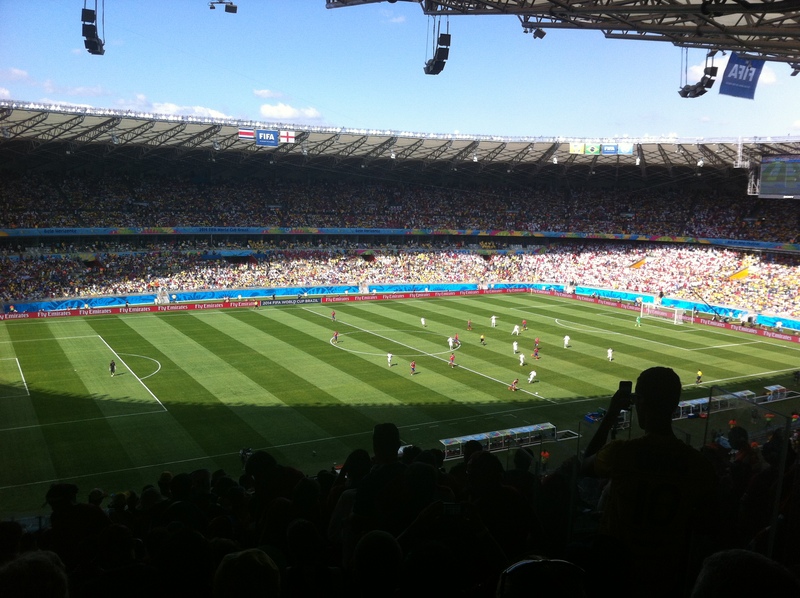 Many other fans have since agreed that the area was one of their best for World Cup nightlife. BH is also considered “Bar Capital of Brazil” by Lonely Planet, so I have no doubt that weekends in Savassi and other lively neighbourhoods make for year-round entertainment. In terms of sight-seeing there seem to be pleasant green spaces to stroll through and interesting museums to visit if these rank on your tourist agenda. But from what I’ve seen (with the benefit of writing retrospectively at the end of my Brazil travels), I would not recommend as a stand-alone destination to visit. Unless you are passing through, or visiting nearby Ouro Preto, I would not suggest you take the detour here. But if you do visit on a weekend or coincide with a cause for Brazil to celebrate, then head to Savassi for a great night!